My day started with my mama bringing over fresh flowers! Isn't she just the best mom anyone could ask for?! I made Cinnamon Raisin bagels for breakfast. I love making bagels. You can make them whatever flavor you want and you don't even have to change out of your PJ's or leave the house! I made the chocolate glaze for my Wicked Good Boston Cream Pie. Now I need to get started soon on my Lasagna. I love the smell of a tomato based sauce simmering on the stove all day! Don't you? What are your favorite smells? I love the smell of Petunia's, coffee, fresh herbs.... There's so many, I could go on all day. Speaking of smells, isn't funny how they can bring on a memory that you had forgotten about? A smell can bring on a flood of memories, influence people's moods and even affect their work performance. Check out this site for more information. It's really very interesting. Enough chitter chatter, here's my totally awesome recipe for Lasagna. In a skillet, cook beef and sausage over medium heat until no longer pink; drain. Add the next seven ingredients. Simmer, uncovered, for 1 hour, stirring occasionally. In a bowl, combine the eggs, parsley, cottage cheese, ricotta and Parmesan. Spread 1 cup of meat sauce in an ungreased 13-in. x 9-in. x 2-in. baking dish. 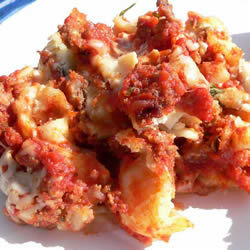 Layer with three noodles, provolone cheese, 2 cups cottage cheese mixture, 1 cup mozzarella, three noodles, 2 cups meat sauce, remaining cottage cheese mixture and 1 cup mozzarella. Top with the remaining noodles, meat sauce and mozzarella (dish will be full). Cover and bake at 375 degrees for 50 minutes. Uncover; bake 20 minutes longer. Let stand 15 minutes before cutting. Looks good, Dee! You are such a good cook!!!! Thanks Jenn! It didn't last long, I think my brother had thirds! It was awesome!!!!! The best I have ever had, and I thought my lasagna was good, but I think my daughter has beat me on this one!!!! Awww, thanks Mama! I love you! Aren't moms wonderful - especially the ones that arrive with flowers! Great lasagna. Love the 5 cheeses, all contributing something different in the way of texture or flavour.